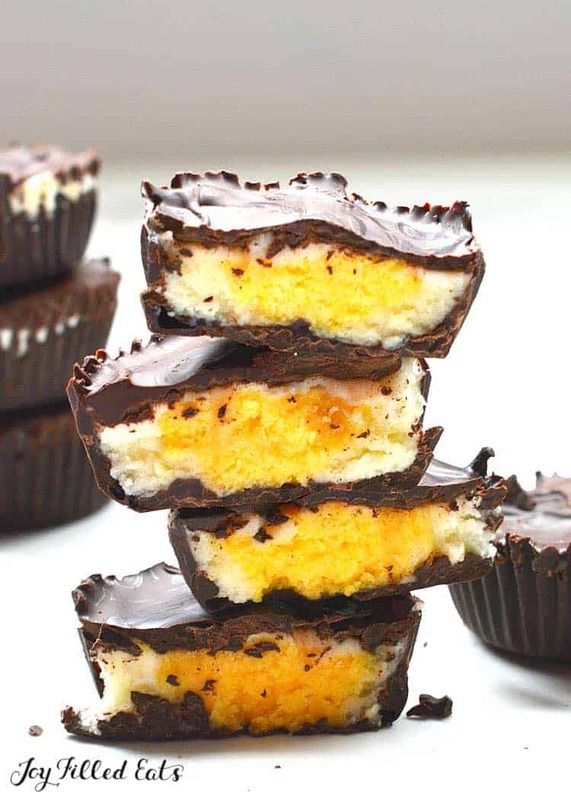 Posted April 8, 2019 Last Edited April 8, 2019 By Erin M.
These adorable Cadbury Cream Egg Cups taste even better than the store-bought kind but are made without sugar! Don’t tell the kids! These homemade Cadbury Cream Eggs are fun to make, super cute, and have only 6 ingredients! Hi, Joy Filled Eats community! Erin from My Flourless Kitchen here and I’m thrilled to share this recipe for homemade Cadbury Cream Eggs with you. I have been thinking about making Cadbury Cream Eggs for a long time. I bought a silicone Easter Egg mold off Amazon (like this one) and I was all excited to try making my own homemade Cadbury Cream Eggs. I filled the molds up with chocolate, let it set, added my egg white filling, then added the yolks and topped them with chocolate, let it set again and then… they all cracked when I took them out of the mold. Heart. Breaking. So on to Plan B: Cadbury Cream Egg Cups! While they may not have the classic egg shape, they are still pretty cute and still scream out Easter treats. Inspired by my Delicious Nanaimo Bar Recipe! 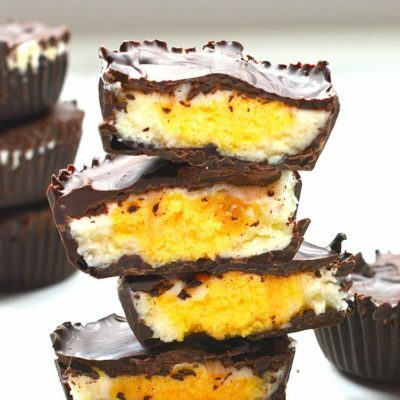 I made the filling for these Cadbury Cream Eggs using the same filling I use for my favorite no-bake treat: Nanaimo Bars. Nanaimo Bars, for those who don’t know, are delicious squares made with a chocolate-coconut-pecan base, a thick layer of custard-flavored icing and then topped with chocolate. Do you see why all Canadians love these bars? They are delicious- you should try them! 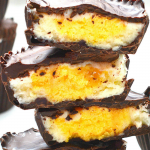 The icing inside Nanaimo Bars turns a deep yellow color when you add custard powder. If you don’t have any custard powder, you can also just use yellow food coloring. The first step is to melt your chocolate chips (I just do it in the microwave, 30 seconds at a time). 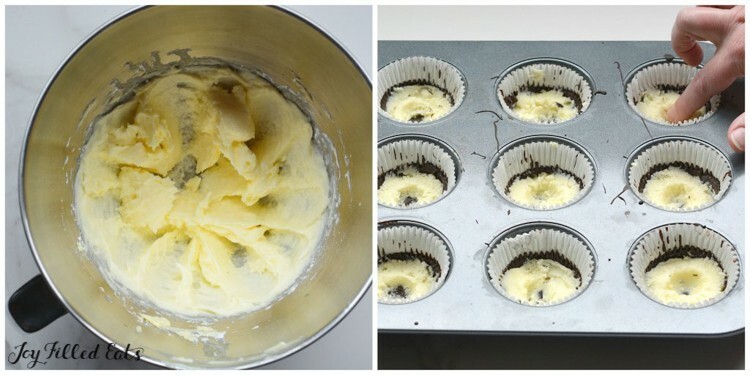 Then, put 12 muffin liners in a muffin pan and fill each with a dollop of melted chocolate. 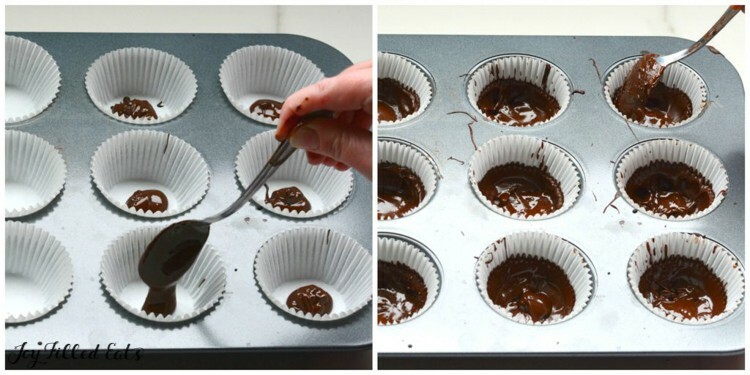 Use a spoon to spread the chocolate around the liner and about 1/3 of the way up the sides. Put the tray in the fridge for the chocolate to set. Next, you make your egg white mixture. I use a stand mixer, but hand beaters would work too. 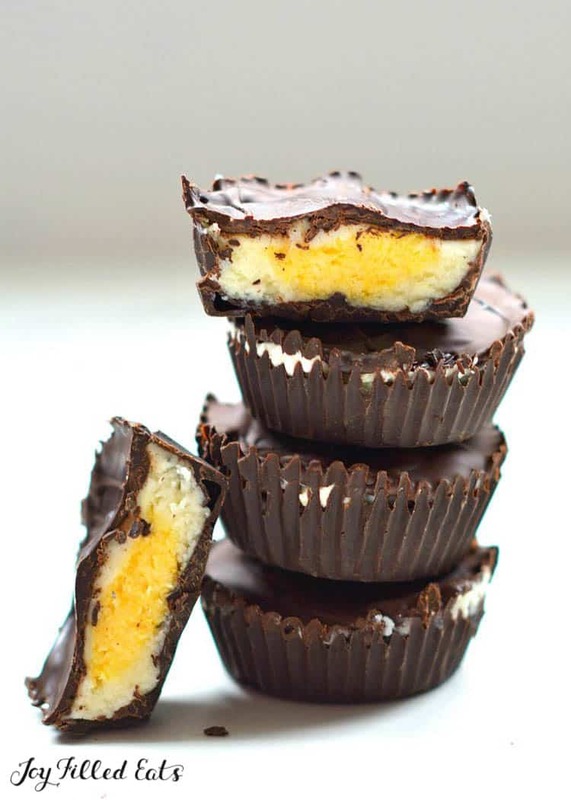 Using about half of the mixture, put a tablespoon or so of egg white mixture into each chocolate cup, forming a depression with your finger for the yolk. Remove about half of the remaining egg white mixture (about 1/4 cup) and set it aside. You should have about 1/4 cup left in the bowl. Add a few drops of yellow food coloring to this mixture to make your yellow yolks. I like to put the mixture in the fridge for 10 minutes or so at this stage so the yolks firm up and are easier to work with. But this is optional. It is going to be messy either way! Use a melon baller to make 12 little balls and roll them in your hands to smooth them out. Put a yolk in each Cadbury Cream Egg Cup. Cadbury Cream Eggs Step 4: Top Them Off! Use the remaining egg white to cover up each yolk and ensure you have a nice flat surface. I just smooth the egg white mixture around with the back of a spoon. Then top with the rest of the melted chocolate and return to the fridge to set up. Phew! And you are done! Full disclosure: sometimes I make these with all yolks to save time. They are cuter with both the egg white and yolk though. And they are fun to make. And so cute. And so much better for you (and your kids) than the store-bought kind, laden with all that sugar. Enjoy! Are you making homemade candies for this Easter? Leave me a comment, I’d love to hear which ones! These adorable Cadbury Cream Egg Cups taste even better than the store-bought kind but are made without sugar! Don't tell the kids! These homemade Cadbury Cream Eggs are fun to make and super cute! Melt your chocolate chips in the microwave in 30-second intervals, stirring after each. Alternatively, you can melt on the stovetop in a double boiler. Put a dollop of melted chocolate into each muffin liner and spread around with the back of a spoon, ensuring you get about 1/3 of the way up the sides. Put the muffin tray in the fridge for the chocolate to set. In a stand mixer, combine the butter, heavy cream, powdered sweetener, and vanilla. (This is your egg white mixture.) 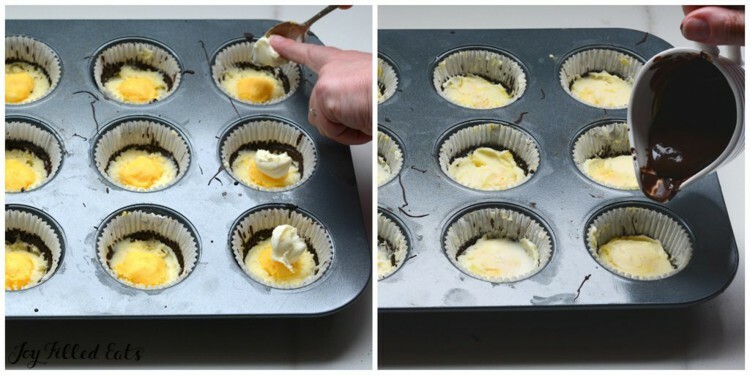 Put a dollop of egg white into each chocolate cup and make an indent with your finger. Remove half of the remaining egg white mixture from the bowl and set aside. Add yellow food coloring to 1/4 cup of the egg white mixture. (This is your egg yolk mixture.) Put egg yolk mixture in the fridge for 10 minutes so it is easier to scoop. 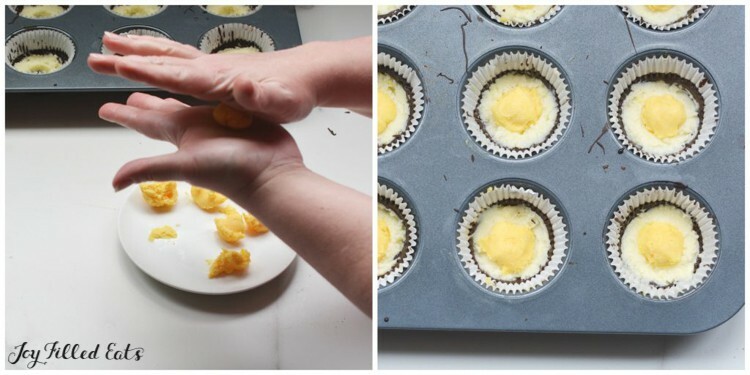 Using a melon baller or small spoon, make 12 small balls with the egg yolk mixture. Roll between your hands to smooth out. Place a yolk in each Cadbury Cream Egg cup. With the egg white mixture that you set aside, put another dollop on each cup, covering the yolk. Spread out the top layer of egg white with a spoon so you have a flat surface. Top each Cadbury Cream Egg cup with more melted chocolate. Return tray to the fridge for another 10 minutes for the chocolate to set. 1 tablespoon, but it will change the nutrition facts. Custard powder is mostly cornstarch so the carb count will go up a gram or so. Love this idea! Looks so delicious and I can't wait to try it! Yes, I think that would work!